During this workshop participants will learn about wolf biology, including pack dynamics, food habits, breeding habits, and dispersal patterns. 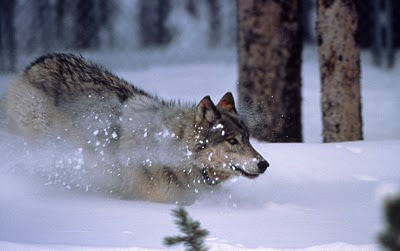 Participants will also become familiar with the ecology of wolves and their role in the ecosystem. There will be a discussion about management issues, including the legal status of wolves and wolf depredation on domestic animals. Weather permitting, participants will participate in wolf monitoring. This workshop is the third in a series of six workshops on the St. Croix National Scenic Riverway that will be held during the 2009-2010 school year. The workshops are designed to increase awareness of the Riverway as a teaching resource by providing experiences that focus on using the Riverway as a learning laboratory for integration across the curricula. The series of workshops will also include discussions from biologists and teachers on how students are conducting scientific research on the river, a presentation and lessons on aquatic invasive species, a birdwatching session, and other hands-on activities, field work, observations, and lesson plan development. While the workshops were designed for classroom teachers (grades 3 – 8), all educators at any level are welcome to attend. Educators may attend any or all of the workshops in the series. Space is limited and registration for the workshop is required. Please call Park Ranger Branda Thwaits at (715) 635-8346, ext. 425 to register or for more information. The registration deadline is Tuesday, January 19.